At the intersection of engineering, physics, biology and medicine, Elliot Botvinick uses laser technology to study the molecular activity of diseases. 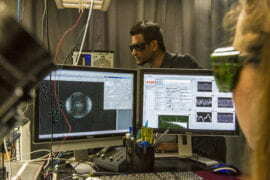 Specifically, he utilizes optical tweezers, which let researchers hold and manipulate single molecules within cells. The work has myriad applications — in cancer, heart disease and diabetes, for example — and could lead to healthcare advances. The old-fashioned “silo” structure of academic research does not apply to Botvinick, a UC Irvine assistant professor of biomedical engineering. He’s affiliated with The Edwards Lifesciences Center for Advanced Cardiovascular Technology on campus and is part of a multidisciplinary team of researchers at UCI’s Beckman Laser Institute & Medical Clinic. Q: How did you become interested in this technology? A: In 2001, after receiving my doctorate in bioengineering at UC San Diego, I was awarded an Arnold and Mabel Beckman Foundation postdoctoral fellowship to work in the laboratory of BLI founder Michael Berns. At his request, I built a robotic microscope that was controllable through the Internet; it included optical tweezers. Through the development of this robot, I began to appreciate the potential of optical tweezers in the study of biology. At first, we worked with the San Diego Zoo’s Center for the Reproduction of Endangered Species to study the swimming force and energetics of primate sperm across species. I then used optical tweezers to explore the role of mechanical forces in cellular signal transduction, homeostasis and disease. This field, mechanobiology, ignited my love affair with the technology and represents the majority of the work in my laboratory at UCI. Q: Simply put, how do optical tweezers work? A: In “Star Trek,” we see spaceships trapped and manipulated by a focused energy beam. The conception and theory of optical tweezers are surprisingly similar. We can precisely measure forces acting on an optically trapped sphere, or “microbead,” that we either introduce into the cell or place in contact with molecules at the cell surface. My lab has integrated optical tweezers into a system also capable of 3-D imaging. Together, we can measure the unfolding of single molecules responsible for many cancers, study the effects of tissue stiffness on cancer metastasis and simulate vascular blood flow — all with real-time fluorescence imaging of a cell’s molecular responses. Q: Can optical tweezers eventually be used to treat diseases? A: Not directly. We utilize optical tweezers in our basic research to study the fundamental processes by which cells decide to divide, differentiate, form organized tissue, repair wounded tissue and maintain health. The better we understand how cells are instructed, the better we can understand how these processes fail, culminating in disease. Our lab is focusing on the role of forces in cell decision making, which will foster advances in tissue engineering, cancer therapies and prevention, and the control of hypertension. 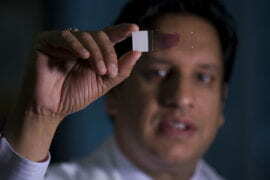 Q: Your group just received a National Science Foundation grant to implement these tweezers in breast cancer studies. What do you plan to accomplish? A: The primary research objective of this grant is to understand why breast tissue stiffening leads to invasive cancer. We’ll test the hypothesis that stiff mammary tissue sensitizes mammary epithelial cells to forces that stretch the tissue; these are called tensile forces and are known to promote invasive cancer. We’ll combine a powerful set of methods, including optical tweezers, to investigate our hypothesis. In the lab, we can grow milk-producing acini, or masses of cells that resemble a many-lobed “berry.” These acini mimic the natural tissue in which ductal carcinoma originates. We’ll monitor cellular signals to determine how these mammary acini respond to tensile forces in both soft and stiff tissue. Our work could have far-reaching effects on cancer research and provide a critical puzzle piece linking breast density and tissue stiffness to the progression of metastatic breast cancer. Q: There seems to be an explosion of technologies being adapted for healthcare uses. How exciting is it to be on the vanguard of employing lasers to learn more about and treat diseases? A: Frankly, it feels wonderful and fulfilling. I have spent years studying mechanical engineering, physiology and laser physics. I feel especially lucky to be where I am — devoting my life to extending the lives of others. Take one area in which we’re trying to make a difference: cancer. There’s nothing simple about it. We don’t understand why it forms, what evolutionary processes gave way to it or how to treat it effectively. The National Institutes of Health and NSF have launched initiatives to draw physical scientists like me into cancer research in the hope that we can provide new perspectives on and analytical approaches to curing or managing the disease. Our NSF grant is co-sponsored by the NIH’s National Cancer Institute and is an example of its newfound interest in the physical sciences. 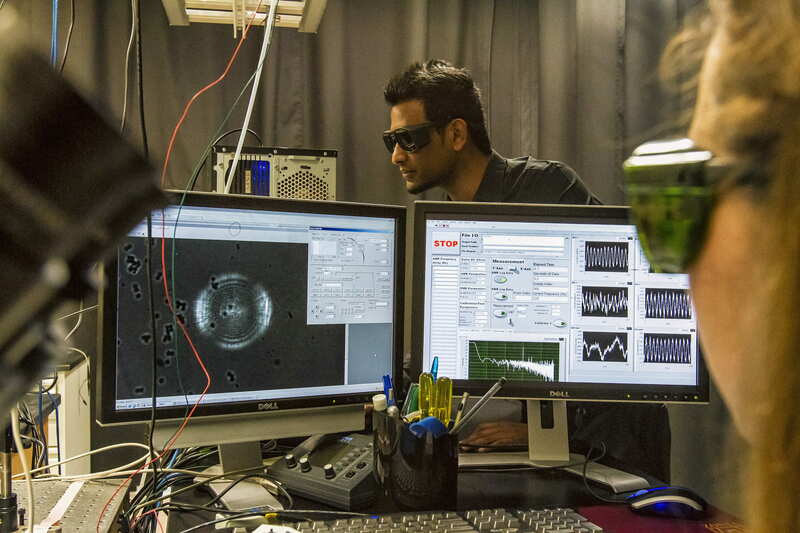 UCI doctoral student Abhishek Kurup and postdoctoral researcher Martha Alvarez (foreground) employ optical tweezers in Elliot Botvinick’s lab to study cellular response to mechanical forces. Elliot Botvinick (left), assistant professor of biomedical engineering, and members of his BEAMS Lab take a break from research outside Engineering Hall.